On Monday, February 9th, the College Art Association published a comprehensive guide to proper practices concerning copyrighted visual materials. The final product, the “Code of Best Practices in Fair Use for the Visual Arts,” is a document designed to outline instances when fair use can be applied to the utilization of copyrighted materials in making art, archiving, museums, and academic scholarship. The need for a document like this is great, as most of the art work referenced in scholarship, classrooms, art-practices, and archives is copyrighted. This 20 page report not only introduces the idea of “fair use,” but also summarizes the guidelines for fair use involving each of the five categories in which copyrighted materials are used. So, what is fair use? Generally speaking, fair use is a provision to the Copyright Act that allows certain use of copyrighted works without permission. Typically this pertains to contexts surrounding education or scholarly contexts. The CAA also developed a clear and engaging infographic outlining both why the field of visual arts requires a fair use code, how this code was created, and the best ways to make use of this information. The infographic argues that many scholars, museum employees, and artists avoid engaging with certain material because it is copyrighted, creating a loss of potential scholarship, online exhibitions, and digital artwork. For particular questions or concerns about fair use, CAA has also provided a helpful FAQ. Overall, the CAA’s development of a “Code of Best Practices” is an exciting one. Go forth and share these guidelines with your peers, and make use of them to further your scholarship, education, or artistic practice! September 8th was declared International Literacy Day by UNESCO in 1965, and has since been celebrated worldwide every year. Its aim is to call attention to the importance of literacy to individuals, families, societies, and sustainable development. Today, approximately 775 million adults lack basic literacy skills, and over two thirds of them are women. Literacy is often defined as the ability to read and write. If you are fortunate enough to have had the opportunities to develop this skill and now find yourself at an academic institution, you also be familiar with other types of literacies. Some examples include digital literacy, financial literacy, computer literacy, media literacy, information literacy, multicultural literacy, and visual literacy. Association of College & Research Libraries defines visual literacy as “a set of abilities that enables an individual to effectively find, interpret, evaluate, use, and create images and visual media.” The authors of ACRL’s Visual Literacy Competency Standards for Higher Education go on to say that the pervasiveness of images and visual media in contemporary culture has changed what it means to be literate. Individuals must develop visual literacy skills in order to engage capably in a visually-oriented society. Visual literacy empowers individuals to participate fully in a visual culture. ACRL has outlined seven visual literacy standards, each including performance indicators and learning outcomes, to help develop a framework in teaching visual literacy skills. These standards include competencies ranging from being able to identify what type of image one needs for his or her research to assessing the ethical and legal issues surrounding use of visual media. Throughout the fall 2014 semester, the University Library will be conducing a workshop series focusing on visual literacy competencies. These workshops will be available through the Savvy Researcher program, and will start October 10th with “Finding and Selecting Images.” Following that will be Interpreting Images, Creating and Incorporating Visual Materials into your Research, and Applying Copyright to Visual Material. The College Art Association has just released a new report titled “Copyright, Permissions, and Fair Use among Visual Artists and the Academic and Museum Visual Arts Communities: an Issues Study.” This report is phase one of a four phase project originally motivated by “concerns about how the actual and perceived limitations of copyright can inhibit the creation and publication of new work in visual arts communities.” The ultimate goal of this project is to develop and disseminate a Code of Best Practices for Fair Use in the Creation and Curation of Artworks and Scholarly Publishing in the Visual Arts. While Colleen Flaherty provides an excellent summary of the report for Inside Higher Ed, the more ambitious may choose to read the full report. The Visual Resources Association published a statement on the fair use of images for teaching, research, and study in late 2011 which was endorsed by the College Art Association. For additional readings, Christine Sundt has aggregated numerous readings and codes of best practices in relation to fair use here. In the spirit of giving this holiday season, The British Library announced on its Digital Scholarship Blog last Thursday that it had released over one million images onto Flickr Commons for anyone to use, remix, and repurpose. The images are taken from the pages of 65,000 17th-19th century books, and span topics such as maps, wall paintings, and comic satire. The library plans to launch a crowdsourcing application to help describe the images at the beginning of next year, much like what the Library of Congress did several years ago. The intention behind this is to use data gleaned from crowdsourcing participants to train automated classifiers that will ” run against the whole of the content.” The data and code will be under and open license, similar to the already available manifests of images available in github. The British Library’s blogpost emphasizes the desire to collaborate with researchers and individuals interested in both the technical aspects of this project as well as future use cases. Zucker, Steven. “Barbarini Faun, Beth’s ipad.” October 18th, 2012. Web. Flickr. Accessed 16 September 2013 from http://www.flickr.com/photos/profzucker/8214231791/. There are a number of online discussions about the challenges involved in obtaining high-quality digital images for educational purposes. These discussions bring up questions like, “These days we’re not trying to preserve Archimedes’ intellectual property. When do you think a piece of art or text becomes the property of the public, as opposed to belonging to the author or the artist?”, from The wide open future of the art museum: Q&A with William Noel. It can be very frustrating to tango between free but poor-quality images with little to no attached metadata and expensive digital image services that control access to a harmful degree. Dr. Beth Harris & Dr. Steven Zucker ask, “Is the discipline of art history (together with museums and libraries) squandering the digital revolution?”, in their blog post, “Can I Use This?” How Museum and Library Image Policies Undermine Education. In his article, “How Art History is Failing at the Internet”, James Cuno ponders the unanticipated observations and interpretations of open access projects like Ghent Altarpiece Web application. The application contains 100 billion pixels, and the images and metadata are available free of charge. While these articles offer much food for thought, it is often difficult to determine if an image can be used for your immediate scholarly needs. Other sources to reference include Stanford University’s “copyright and fair use” page, the Visual Resources Association’s statement on fair use, the Digital Image Rights Computator, and Peter Hirtle’s “copyright term and the public domain in the United States” chart. The University Library is also offering a workshop on September 20th at 11am in room 314 that will cover where to find images online as well as basic copyright considerations. Hope to see you there! “It’s a great day for education and progress, as if the Ancient Library of Alexandria had met the Modern World Wide Web and digitized America for the benefit of all,” said Doron Weber, Vice Chair of the DPLA Steering Committee. First, an easy-to-use portal where anyone can access America’s collections and search through them using novel and powerful techniques, including by place and time. Second, a sophisticated technical platform that will make those millions of items available in ways so that others can build creative and transformative applications upon them, such as smartphone apps that magically reveal the history around you. Third, along with like-minded institutions and individuals the DPLA will seek innovative means to make more cultural and scientific content openly available, and it will advocate for a strong public option for reading and research in the twenty-first century. Library Journal also has an article in celebration of the DPLA launch that highlights the collaborative efforts made along the road. We hope you enjoy this exciting new collection! The Visual Resources Center is pleased to announce the launch of their new website! Discover tools for editing, presenting and preserving visual materials! Get help and further resources! The new website contains much of the same content as the old, but we’ve moved things around in the hopes of making it more streamlined and easier to find what you’re looking for. Please send us any comments or suggestions you may have! Instructional images will continue to be available via ARTstor. Copyright can seem like a real quagmire sometimes. What images can I use without messy repercussions? Is someone going to sue me? What is open access? What is fair use? Well, I’ve got good news. The National Gallery of Art has a collection of images you can reproduce without fear, for any use. Over 20,000, high-resolution, open access images are at your disposal. For free! You can be sitting pretty like our pal over here, with your polished, professional, and perfectly legal presentation. Copyright currently covers a work until 70 years after the creator’s death. That is the simple version though. I mean, really simple. A more nuanced approach to copyright can be found on April 9 at the Savvy Researcher Workshop titled: Practical Copyright: Considerations for Teaching and Research. You’re probably thinking that this can’t possibly get any better. But it can. NGA also includes a reproduction guide in it’s help section for those of you publishing with images. Including this document when you send images to you publisher will help to ensure maximum image quality, making you and your publication shine. Recently Nancy Sims, the copyright program librarian at the University of Minnesota, was on campus to talk about copyright and academia. As both a lawyer and a librarian, her voice on such matters is highly valued. Back in May of this year she was interviewed by Jennifer Howard of the Chronicle of Higher Education, with the resulting article being called “What you don’t know about copyright, but should.” The article reads as a bulleted list of pointers about copyright, and provides much food for thought. Not too long after the Chronicle of Higher Education published the article about Nancy Sims, it came out with another copyright article written by Jeffrey R. Young about fair use in education. Called “Pushing back against legal threats by putting fair use forward,” it features two scholars at American University—Patricia Aufderheide, a film-studies professor, and Peter Jaszi, a law professor. The two professors recently published a book titled Reclaiming Fair Use: How to Put Balance Back in Copyright, which deals with what they call misperceptions about the fair-use rules of U.S. copyright law. This is not the first time Aufderheide and Jaszi have worked together; since 1996 they have been researching fair use and publishing guidelines for different types of creative work, such as documentary filmmaking. While I haven’t read the book, it sounds like it could be a great read on a complex topic. 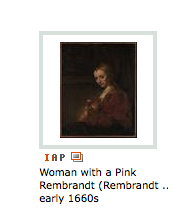 Ever notice the little icons below the image thumbnails while you’re browsing ARTstor? One of the icons simply says “IAP,” which means images for academic publishing. This ARTstor program “seeks to facilitate scholarship in the arts by reducing the costs associated with publishing images in academic journals and similar publications.” Images with an IAP icon associated with them are available to use free of charge in scholarly publications. There are currently 6,700 images provided by the Metropolitan Museum of Art, and 3,900 images from the Mellink Archive at Bryn Mawr College. For more information regarding this program, click here or contact ARTstor. Click below for an excellent tutorial on copyright and image management from Georgia Harper, Office of General Counsel at the University of Texas. This is a component of the excellent website Crash Course in Copyright.